All around the United States Capitol campus, there is something that you cannot avoid seeing as you look at the historic buildings that symbolize and house our democracy: stone – one of nature's more enduring materials. The marble, limestone, sandstone and granite used to construct the U.S. Capitol, House and Senate office buildings, Supreme Court Building and other structures around the campus come from different parts of the country. To preserve the historic fabric of these buildings and allow them to continue to serve the government as places to conduct its business, the Architect of the Capitol (AOC) is undertaking a comprehensive effort to restore the stone of these buildings. Nearly half of the campus' buildings are undergoing stone restoration as exposure from the elements have damaged the stone over time. Some of the most prominent problems include the failure of mortar joints and caulking, soiling and general weathering of the stone. To address the deterioration, the AOC is gently cleaning the stone, applying poultice to remove stains, repairing cracked and spalled stone and replacing mortar and caulking. Any stone that is damaged beyond repair is replaced with new stone, carved either by hand or by combination of machine cutting and hand finishing. 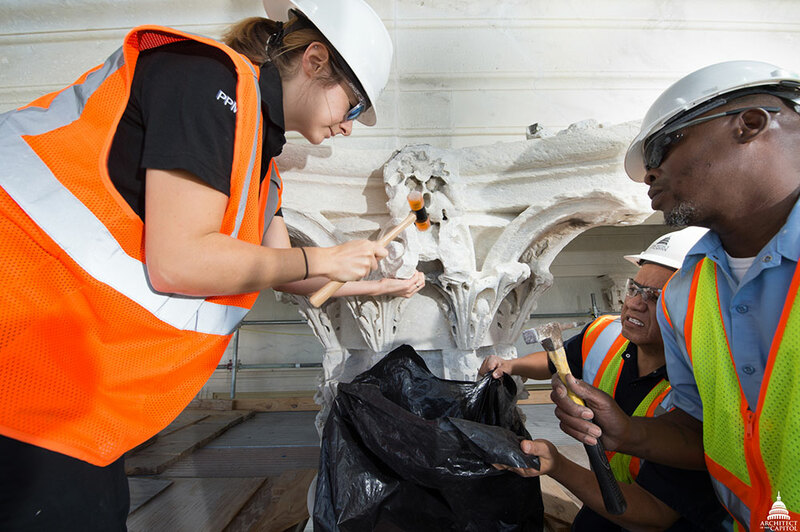 Restoration work on a column capital on the west façade of U.S. Capitol's north wing. The U.S. Capitol is undergoing a full restoration of its stone and recently completed the Senate Extension and Connecting Corridor portion of the building. The results of the completed work are noticeable with the naked eye if you compare it to other portions of the structure. "Who knew that marble could crumble into dust with just a little effort due to 150 years of weathering? 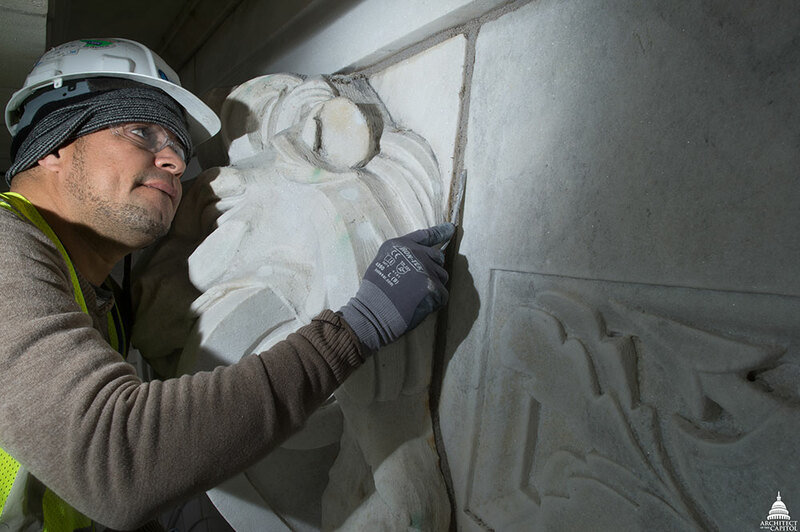 You do not know the true stone condition until you can inspect it and touch it," says Christopher Lear, who managed the first phase of the Capitol Stone and Metal Preservation Project. Stone awaiting restoration at the Thurgood Marshall Federal Judiciary Building. The first phase of the Thurgood Marshall Federal Judiciary Building restoration project involves the installation of safety netting at select locations of the building. Subsequent phases will include the removal of the building's veneer and replacement of damaged stone panels on the building's façade. Condition of the stone on the Russell Building pre-restoration. The stone of the Russell Senate Office Building – the oldest of the three Senate buildings – has lost some of the fine details of its exterior stone due to exposure to the elements over its 110-year history. A five-phase project to preserve the century-old building's stone, bronze, wood windows and glazed doors is underway and will improve the building's energy efficiency. Joy Jordan, who oversees this project, is reminded of a Theodore Roosevelt quote as she works on the project: "The nation behaves well if it treats the natural resources as assets which it must turn over to the next generation increased, and not impaired, in value." Restoration work on the Cannon Building's exterior façade. The Cannon House Office Building is currently in the midst of a 10-year, full-building restoration, which includes conservation and repair of the exterior and interior stone. Work is similar to what is being done at the U.S. Capitol and Russell Senate Office Building. Cleaned stone (right) on the USBG Conservatory. 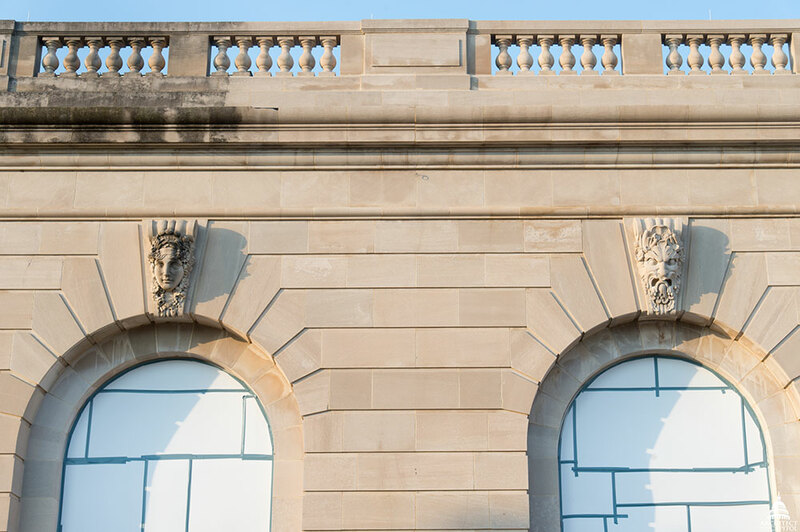 The historic limestone façade and roof of the USBG Conservatory are currently undergoing a restoration. The building, annually hosts more than a million visitors. During the past summer the limestone that comprises its façade was cleaned; partially repointed and Dutchman repairs were made where stone anchors cracked the stone. The roof replacement work is ongoing. "It's such a great experience being able to get close to these historic buildings and see the difference in the stone after we've restored it," states Laura Cameron, Chief in the Project Management Branch and Program Manager of the USBG Conservatory Façade and Roof Restoration. "Seeing the final results and preserving these buildings for future generations makes all the hard work more than worth it." Stone being restored on the Grant Memorial. The Grant Memorial's bronze statues were recently restored and repaired, but work on the stone pedestal, concrete structure and utilities continues. Work on the stone will resume when warm weather returns in the spring of 2018. 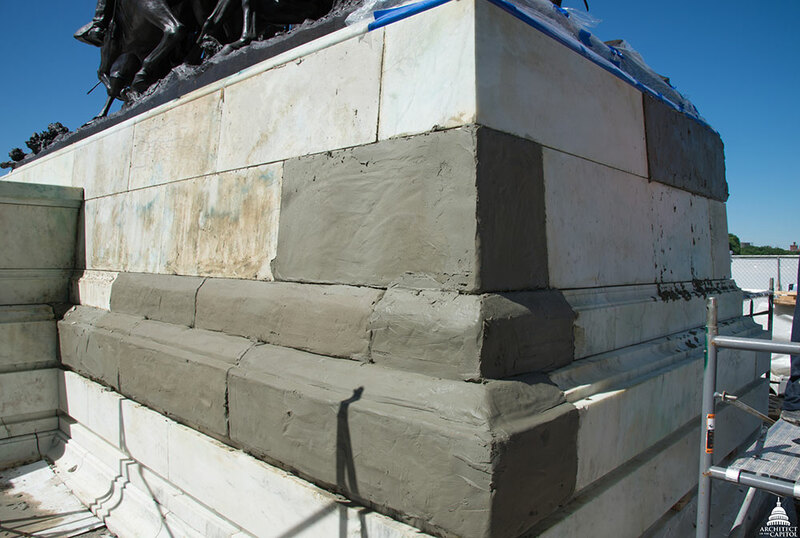 "Stone is an integral part of the fabric at the Capitol and surrounding sites," states Joe Coratola, Project Manager for the Grant Memorial stone restoration. "It is our duty and honor to preserve these historic sites for future generations to treasure." Restoration work on the west façade of the Supreme Court Building. Work was recently completed on the west, north, south and east façades of the Supreme Court Building. The project entailed removing general soiling, black gypsum crusts, biological deposits and copper stains with low-pressure water and environmentally friendly cleaners. Copper stains were removed with a poultice that pulled the stains out of the stone. 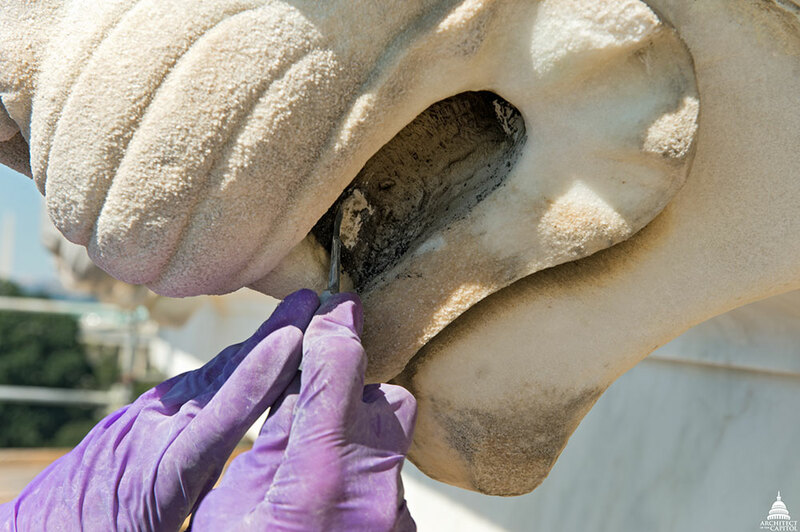 Lasers were used to remove the heavy soiling and gypsum deposits at the carved stone and the pediment and cheek wall sculpture. All mortar and sealants in the joints of the marble were replaced and the non-functional electric bird deterrent system was replaced with passive wire and net. 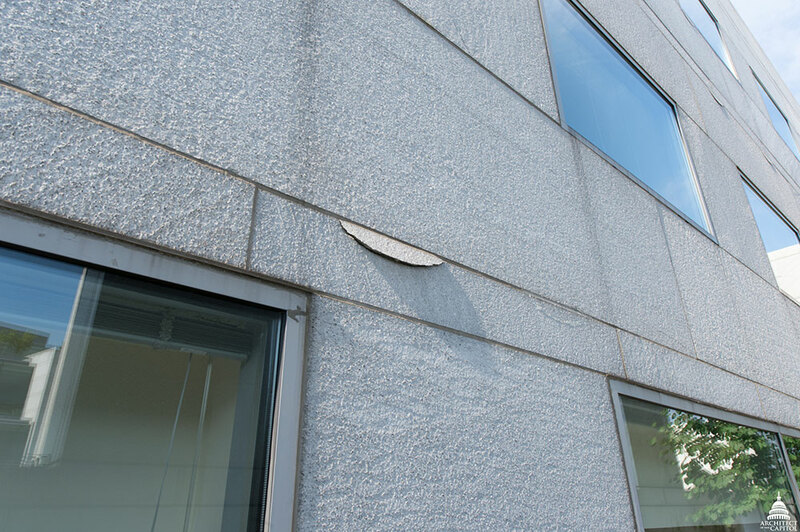 Cracked stone was re-anchored and new stone was installed to replace missing elements and those that had deteriorated to the point of failure. 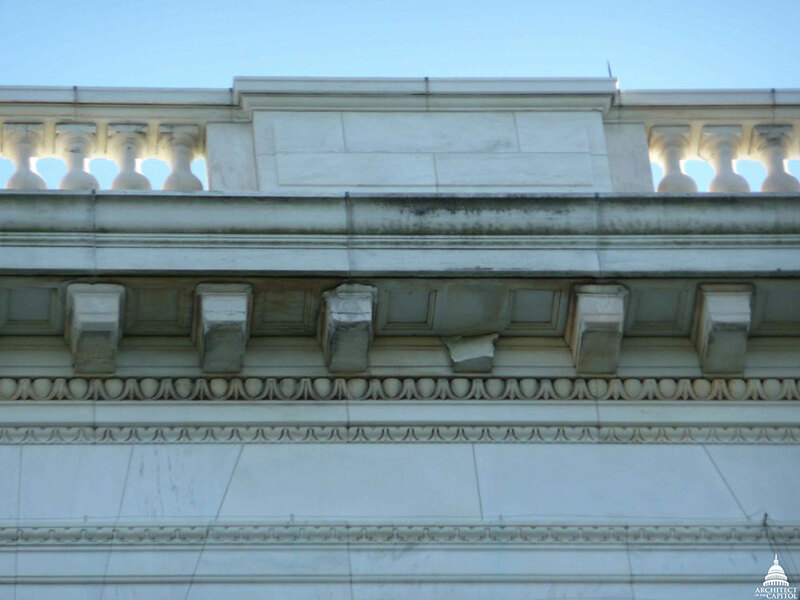 Stone preservation will continue to be a priority of the AOC as the best way to maintain the buildings across the Capitol campus is to constantly monitor them. Updates on these projects are available at www.aoc.gov/stone.